This was NOT in the plan. I was going to leave Oaxaca on July 20 unfettered. Wind things up. Pack the bags. Go. 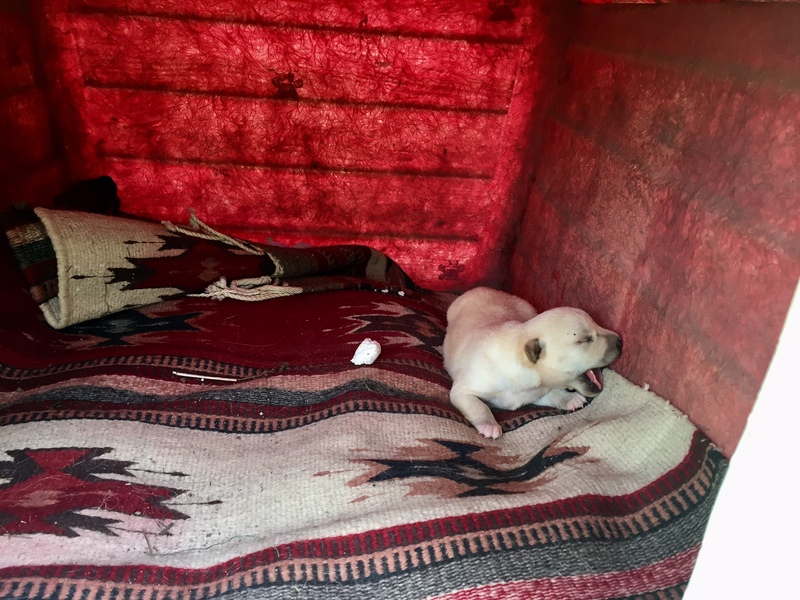 Now, there is a Mamacita Perra (female dog) and her two pups camping out in the campo behind the casita where I live in Teotitlan del Valle. I discovered them a week ago, maybe June 29 or 30, when I approached a golden beige mound in the tall grass. I almost stepped on a furry brown ball the size of my fist, maybe four inches in diameter. And, then it moved, ever so slightly. And there was another one, the color of oatmeal, a form barely distinguishable as a living being. 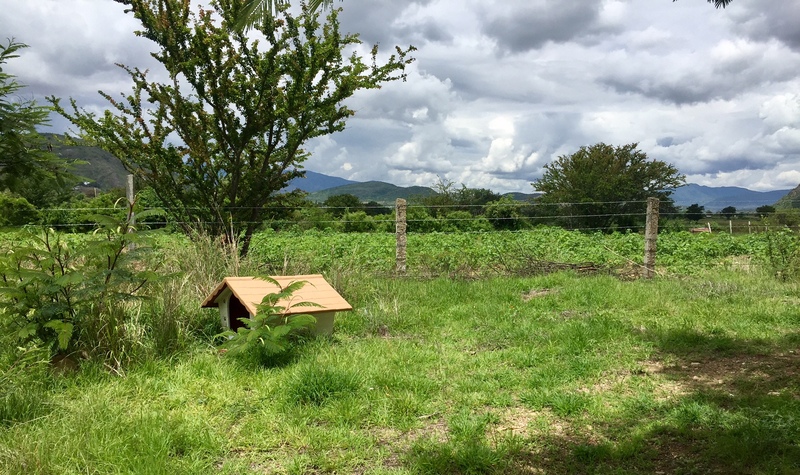 It was then I realized that this dog had just given birth, maybe that day, maybe the day before, secreted behind a young guaje tree, protected from view by grass three feet high (photo above, left of dog house). Yipes. What was I going to do? Feed them, of course. The nursing female was bony. I could see her skeleton as she curled up on the earth. Her fur looked like it was going to fall off her body. Her teats sagged and did not look capable of feeding offspring. 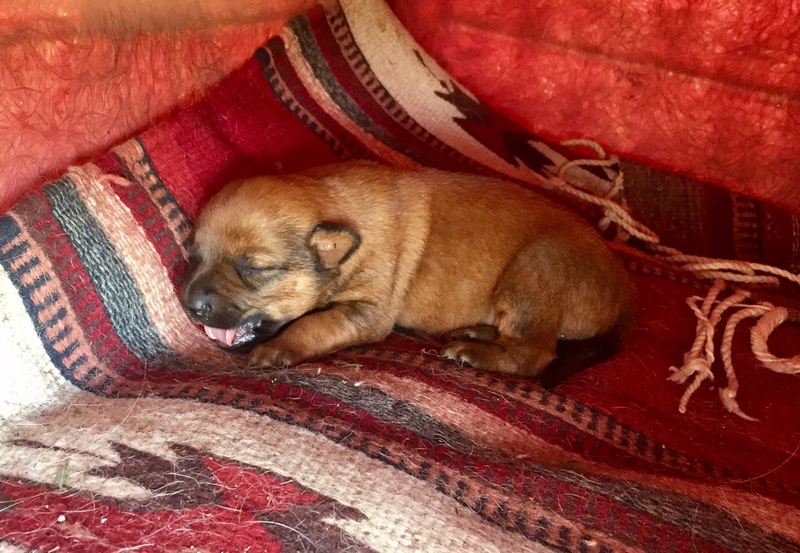 Brown puppy, eight or nine days old. Eyes wide shut. Early on, she would growl lightly as I approached. Now, she knows I won’t hurt her. Today, I patted her head. She is letting me in. 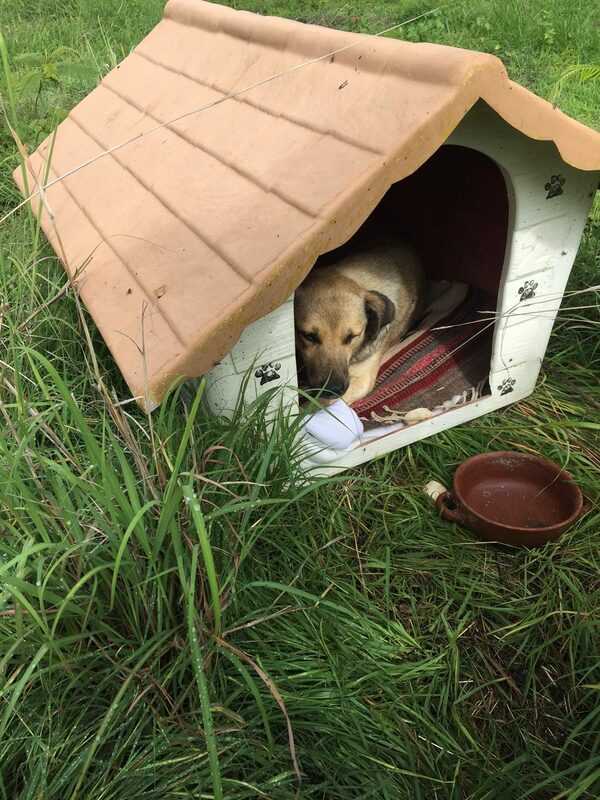 I imagine that abandoned dogs feel a lot like abandoned people: wary, on edge, not trusting. I live in the country, out beyond the village, in the periphery, amidst corn fields, mountain views, wide open spaces, dirt roads, and dogs on the prowl who have been cut loose from their tethers, neck ropes dangling as they run in search of food and shelter. One of the puppies. The dark brown one is hiding. Mexico has an abundance of street dogs. Most never get spayed or neutered. People say its a cultural thing, manhood identity. Female pups are usually done away with. No one wants unwanted babies. This is their solution. Families get their (usually male) dogs as pups, tie them up to a fence post or tree, and feed them once a day. Maybe. Sometimes, they bark too much. Cut them loose. Sometimes, they growl at the children. Cut them loose. Sometimes, they get too big and aren’t cute any more. Cut them loose. Sometimes, they eat too much. Cut them loose. Sometimes, they take more care than an individual or family can provide. Cut them loose. Sometimes, they turn out ugly. Cut them loose. Sometimes, owners just tire of the responsibility. Cut them loose. Few get vaccines. Few are treated for fleas, eye infections, other maladies. They are the discarded and forgotten. And, this is who showed up in my backyard. My friend Merry Foss has been operating spay/neuter clinics here in the village for two years. She usually takes a handful of dogs once or twice a month, when the owners agree and bring them. Sometimes, this takes some cajoling. It makes a small dent in the bigger problem. There is a modest charge. Two veterinarians come from Tlacolula to do the procedures. She never has enough money to support the program. Some people can’t pay. Merry’s veterinarians are making a house call on Monday to check out my wards. When the female is done nursing, I will pay to have her spayed. But, who will take care of this Family of Dogs when I leave in two weeks? Who will oversee the spaying of the female? Who will adopt out the pups to good homes? What will happen to them? Now, this is something to worry about! Each morning, I arise and prepare their breakfast before mine. Tortillas, cooked meat and broth. I repeat the ritual before sunset. She inhales the food. She is filling out. The pups are growing. Three days ago, Merry’s friend Kevin brought over a dog house. I lined it with soft cotton bedding and a small rug purchased by my wasband years ago that I figured now belonged in the doghouse. She (the mother dog) would have nothing to do with it. Yesterday, I put on rubber gloves, and when mom was gone (wherever), I carried the pups and put them inside the house. They are about eight inches long now, eyes still shut tight. She returned, climbed in, and a couple of hours later, all three were outside in the grass again. But it rained last night, and again today. The weather turned damp and chilly. This morning the Dog Family was warm, dry and secure, happy inside the house. I haven’t had a dog in forty-five years. My first and only ran out onto a highway and was hit by a car before my eyes. Too painful to go through that again. I’ve never considered myself successful with animals. Too much work. Too much travel. Not enough time. Don’t want the added responsibility. I wasn’t raised with pets. An idea for companionship I consider from time to time, but never act upon. So, this is something new. And the tragedy is that I won’t be here to participate in the rest of the story. I’m wondering if there is someone out there who would like to step in to help? That means you would need to be here! OR make a gift here and I’ll make sure she gets it. Choose your amount. The amount is the number after the last backslash. Or, create your own amount. PayPal will deduct 5% from the transaction. Edd Morris grew up in the United Kingdom (UK) on the Wales-England border. He just finished medical school in London, England, and decided to return to a Spanish-speaking country to volunteer in a community service project before going on to a two-year hospital residency back home. He has a passion for people and community health. 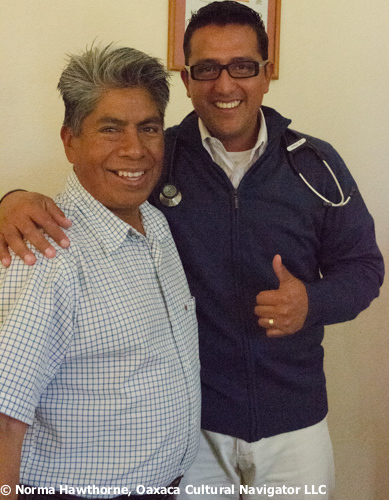 When he contacted us about coming to Oaxaca, we helped place him in the Teotitlan del Valle public health clinic. Here is his story. 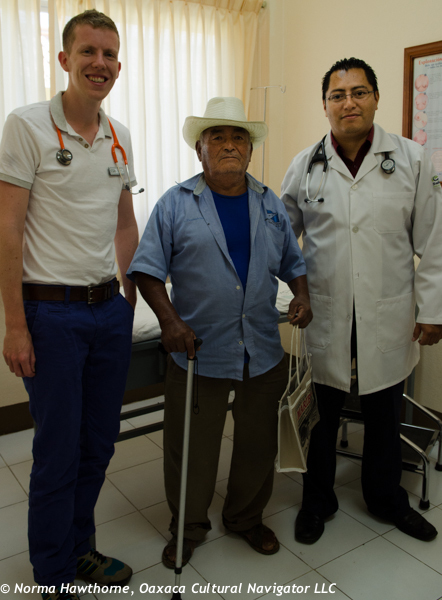 “I’ve always wanted be a General Practitioner (that’s what we call Family Doctors in the UK) and so I thought it would be an incredible opportunity to volunteer in a community clinic in rural Mexico. 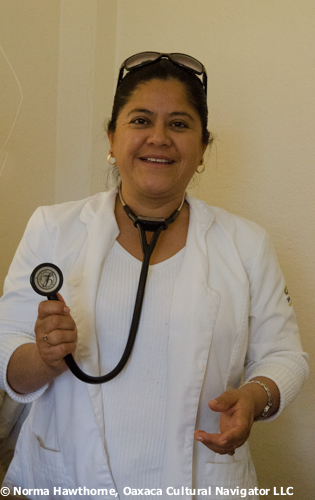 I’ve been here for a month, working alongside the doctors and nurses of the Teotitlan de Valle Centro de Salud. I’ve observed consultations and undertaken my own, too. I’ve accompanied the nurses on a community vaccination drive, And, I’ve dressed a lot of wounds and ulcers! One programme here really caught my imagination. It’s called Oportunidades, and it’s a national social support system offered by the Mexican state. Through Oportunidades, disadvantaged families can receive financial support from the Mexican Government, as long as they fully participate according to the plan. There are different strands to the programme — the children in the family must attend school and the head of the household is required to go to seminars about healthy living, for example. Healthcare is a crucial aspect. Everybody who participates in Oportunidades must attend a six-month health check with a doctor, and children must be up-to-date with all their vaccines. Doctors should bring up relevant issues at every health check-up. For example, it is important to discuss pregnancy prevention with adolescents. Families who demonstrate their engagement with the Oportunidades programme then receive financial support from the government. The money is paid directly to the bank account of head of the household – effectively wiping out any diversion of funds. What’s even more impressive is that the role of head-of-household is always delegated to a woman. Mexican research has shown that when a woman receives the money, she’s much more likely to spend it on her family and children – exactly those the programme is meant to support. 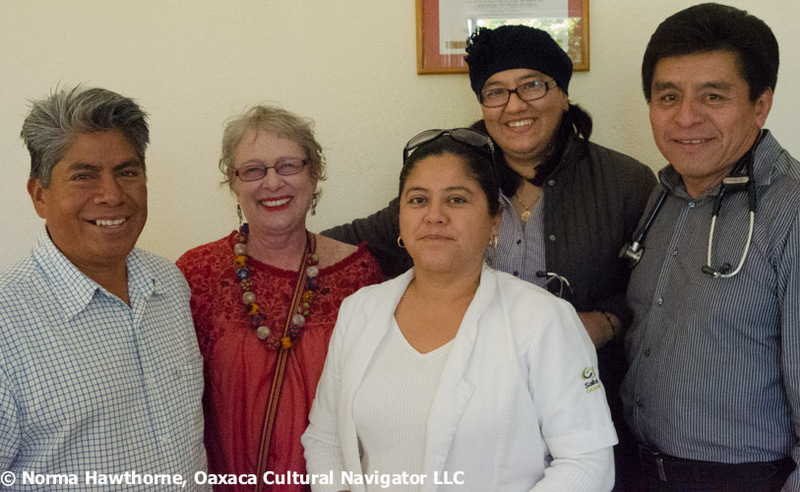 Edd Morris leaves Teotitlan del Valle, Oaxaca, on June 18, 2014. When he returns to London, he will begin work at Queen Elizabeth Hospital, London which serves a diverse, low-income population. He receives his official medical degree from St. Georges, University of London (www.sgul.ac.uk) in two weeks. 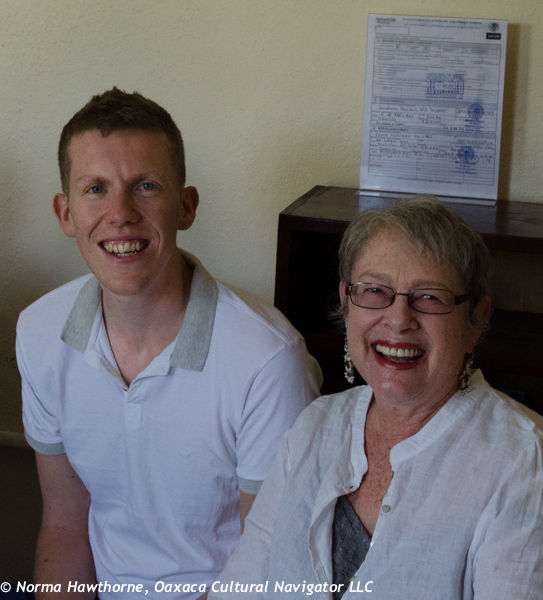 Edd remarked about what a rich, meaningful and culturally diverse experience this has been to have a direct connection with the local population. What he learned will help prepare him for the next step in his profession. From all accounts, everyone he has come in contact with has enjoyed knowing, working with and hosting him here. When are you coming back? was a question I heard all day. We are accepting applications for volunteers to serve in the public health clinic for 2014 and 2015. You must be a student in a baccalaureate or masters degree program in the following fields: nursing, medicine, physician assistant, and be a Spanish speaker with at least one-year of university level language skills. If you are interested, please contact us. 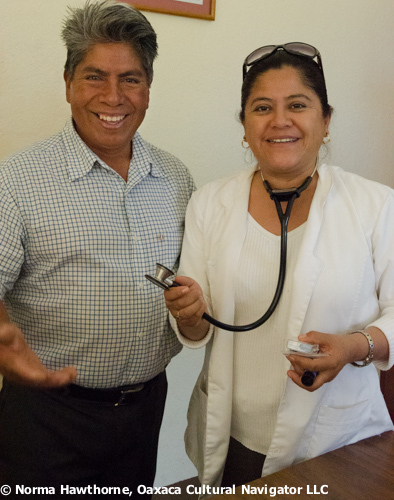 This week Federico Chavez Sosa and I made a visit to the Teotitlan del Valle, Oaxaca Centro de Salud (public health clinic) to present a gift of five stethoscopes to the clinic doctors. The gift is from Dr. Deborah Morris, MD, PA-C, academic coordinator and the Methodist University Physicians Assistant Program in Fayetteville, NC. 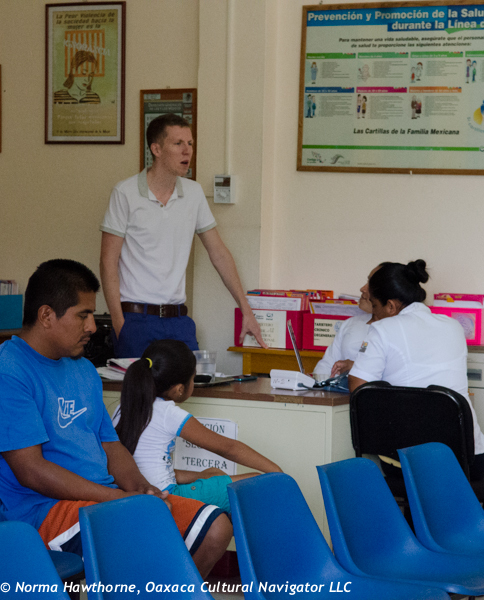 The Centro de Salud hosted two Methodist University physician assistant students, Ben and Megan, in summer 2013 for a one-month externship residency. They reported that the doctors would benefit from better quality equipment and suggested that the stethoscopes would make an excellent contribution to improved quality of care. 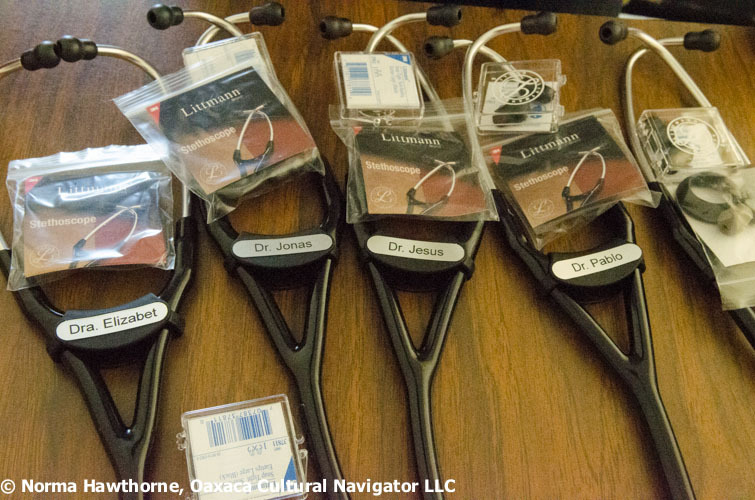 Of course, they asked the doctors first if they thought they would like to have new stethoscopes after the doctors admired the ones the students brought to use during their externship. 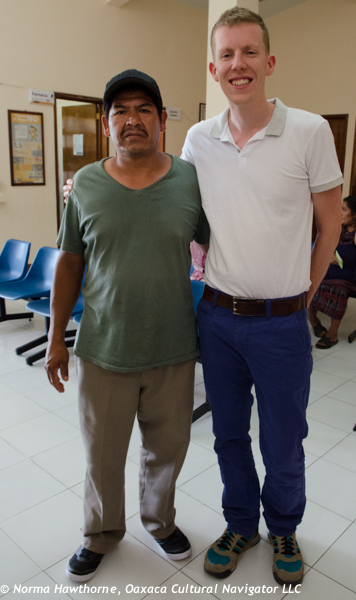 Federico made the presentation to clinic director, Doctora Elizabet, on behalf of the village as he ended his three-year community service commitment as one of three volunteer committee members to lead public health services, including water quality, sanitation, and community health. This service, called a cargo, is a mutual support practice of Usos y Costumbres indigenous Mexican pueblos. We welcome university level nursing and physician assistant students to ask about participating in a summer residency. Basic Spanish language is necessary. Openings are available for summer 2014 and scheduling is flexible. The cost includes lodging, two daily meals, facilitation, and a contribution to the clinic. Please contact Norma Hawthorne if you are interested. 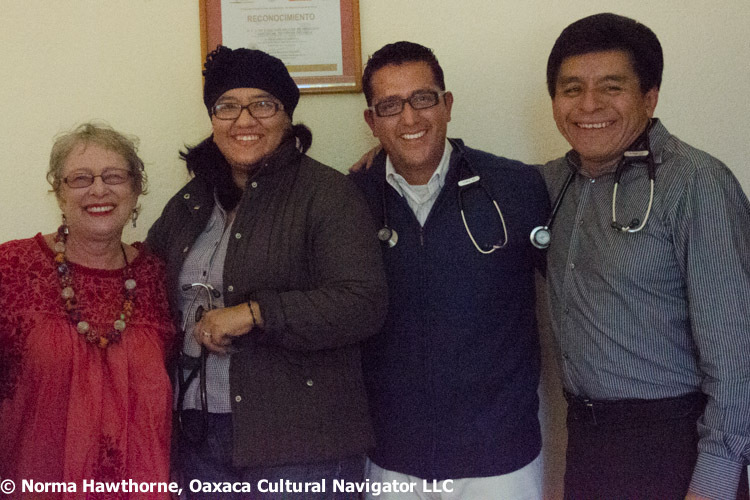 Kathy Ray, a bachelor of science in nursing (BSN) student at the University of North Carolina at Chapel Hill, spent two weeks volunteering in the rural public health clinic in Teotitlan del Valle, Oaxaca. The learning experience was invaluable. She developed what will be, she is certain, lifelong professional relationships with local nurses and doctors. She improved her Spanish language skills and she developed a greater appreciation for Mexico. The village has one of the better-equipped clinics in the region and many patients from smaller villages are referred there for their primary care. Because of that, the patient census on a given day can be high. The clinic has two general practitioners, a pediatrician, a psychologist, social worker, nurses and a dentist assigned for patient care. It serves 8,000 village residents plus people from more remote rural villages. They welcomed Kathy Ray with open arms. Kathy loved living in the village and volunteering there. “It was the first time in my life I have been on my own,” she said. “I got married young and started raising children when I was 22 years old.” She had never been out of the U.S. before. She started a fun Brazilian exercise program, called capoeira, for teens and pre-teens held in the central plaza in front of the church. The exercises incorporate music, games, dance, acrobatics, and martial arts (it is non-violent, she explains). The children loved it, and she got several repeat participants. (You can see examples on YouTube.) Pre-teens and teens everywhere are at risk for early onset diabetes and fun exercise helps overcome the risks. Kathy gave rubella, DPT, and hepatitis-B vaccinations to children and adults, and shadowed the ob-gyn doctor. She learned hands-on techniques, and also shared ways that Carolina nurses are taught to give emotional caring and support to patients who are in medical crisis. Kathy is a mature and wise 39 year-old mother of teenagers. This gave her the ability and perspective to become a peer professional. She has posted photos there, too. 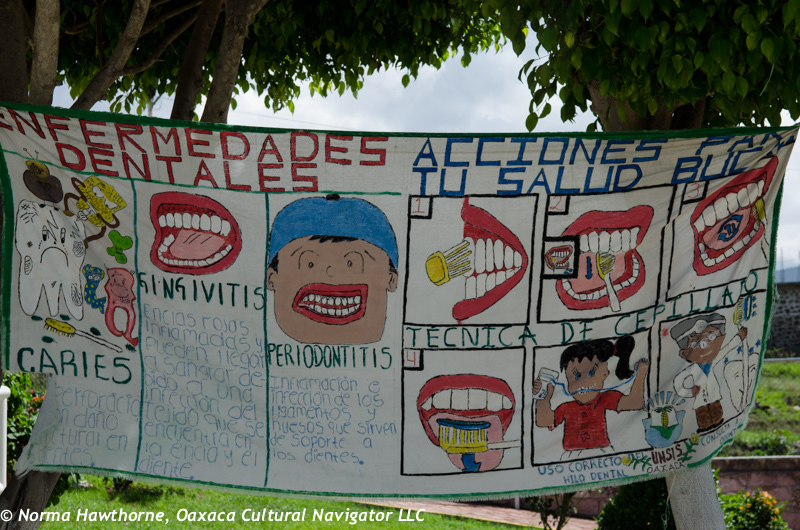 For me, it has been such a delight to place nursing students in Oaxaca as part of a global study experience. It has been four years since I started this program with the help of Federico Chavez Sosa. And, it is beneficial for students to be volunteering in Mexico since many of our immigrants are from Spanish-speaking countries. 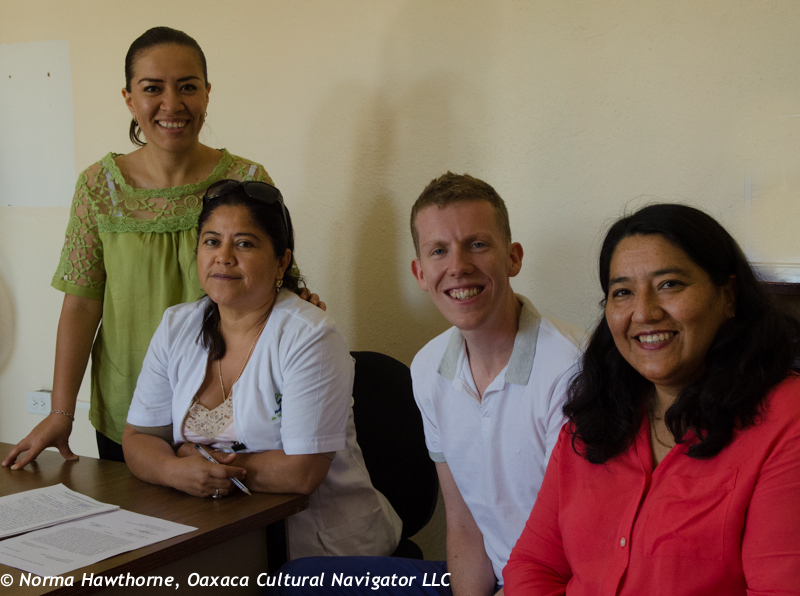 Teotitlan is perfect because it is safe, small, welcoming and we have a network of relationships there. The village health professionals receive the benefit of smart, educated and dedicated nursing students to help. How did Kathy manage on a strict student budget? “Every day, someone would come to the clinic with a frozen milky drink flavored with cinnamon (horchata) that we would all buy for 40 cents each. That was a highlight of my day,” Kathy remembered with a smile. Kathy will receive university credit for this experience after she writes and submits a paper under the guidelines of the global study program at the school of nursing.